Do Native Americans Celebrate Christmas? 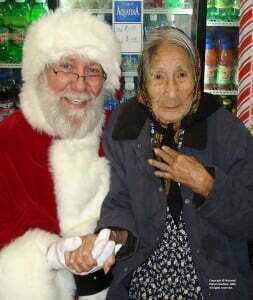 Native American / American Indian Blog by Partnership With Native Americans | Do Native Americans Celebrate Christmas? Do Native Americans Celebrate Christmas? There often arises the question among non-Native Americans as to whether or not Indians celebrate Christmas. Well, the simple answer is yes, many of us do celebrate Christmas. But, to understand the complete answer, one must look at the question through the lens of history. For centuries before any European contact, Native Americans held in high regard the winter solstice, which occurs on December 21-22, and they held celebrations around that time of year. After European contact, many Native American tribes blended Christian beliefs with their traditional cultures and began celebrating a hybrid of Christian and Native beliefs. In fact, about three quarters of the Indian population identifies with a secular faith, the most common being Native American Catholics. So, their celebration of Christmas should not be a surprise. 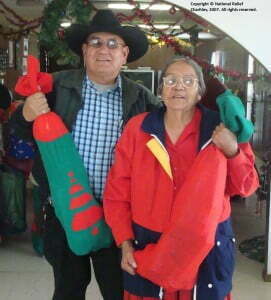 In addition, the holidays are a time of giving and this is not a foreign concept to Native cultures. All throughout the year, many Native American cultures celebrate special occasions and events with giveaways. Such generosity in Native cultures is a sign of a giving heart, with spiritual as well as social value. So, the concept of holiday giving easily coincides with traditional Native American beliefs. Both the Winter Solstice and Christmas are a time to look forward to what is coming in the new year, a time when hope abounds. This is also a time when our organization is focusing on services for those that perhaps need a little boost of hope and cheer. In addition to providing services such as winter fuel for Elders to heat their homes, staple foods for senior centers and Thanksgiving meals for Elders and their families, each year we help brighten the holidays for tens of thousands of Native Americans through our Holiday gift and meal programs. Native children, teens, families and Elders alike enjoy the gifts and the opportunity to celebrate the holiday season in the same ways as other Americans. This entry was posted in Humanitarian and tagged American Indian, Christian beliefs, Christmas, National Relief Charities, Native American, spirit of giving, time of giving, winter solstice. Bookmark the permalink. Trackbacks are closed, but you can post a comment. Alexis, thanks for your note. PWNA is serving 60 different tribes and so there are differences among them. Some do not participate in Thanksgiving but many do. For instance, in 2014, PWNA was privileged to provide Thanksgiving meals for some 15,069 Native Americans, and this year we are gearing up for a similar level of support for the tribal communities we serve. These Thanksgiving meals are requested by our tribal partners; the only supplies we deliver are those our partners request to support solutions they have developed within their communities.